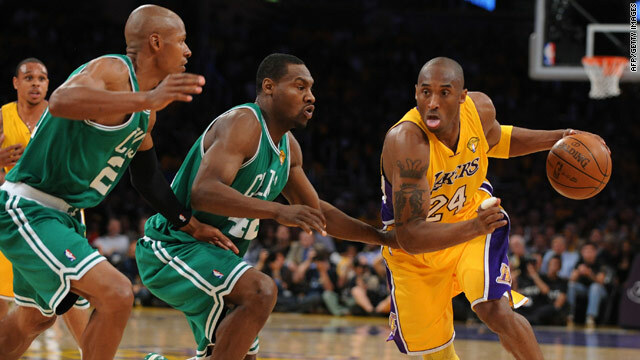 Ray Allen's run of 12 points in 27 minutes for Boston was not enough for them to catch L.A. rivals. (CNN) -- The L.A. Lakers beat the Boston Celtics 102-89 in the first match of the NBA finals in Los Angeles on Thursday night, as they attempt to defend the title they won last year. L.A.'s star guard Kobe Bryant -- who is aiming to win the NBA title for the fifth time in his career -- scored 30 points to take his side to victory over their east-coast rivals. The Lakers led from the start and had a five point lead after the first quarter, which they increased to 20 points with just 10 minutes left to play. The match marked their 12th consecutive win at home in the post-season and they will now host the second game of the best-of seven match series on Sunday 6 June, before play moves to Boston. Spanish center Pau Gasol played a key role in the first-match for the west-coast team, scoring 23 points. "Pau played a big game tonight. His movement and his activity was important," Lakers head coach Phil Jackson told the team's official Web site. Andrew Bynum -- who despite suffering with a right knee injury prior to the match which threatened his place in the team -- also contributed to the Lakers win, finishing with 10 points. "It was great to have Andrew," team-mate Gasol told the official Lakers Web site. "Obviously he was a big factor tonight. Really contributed in different ways, and we want to see him as much as possible out there." And after crashing with the Celtics Paul Pierce in the opening 27 seconds of the game and receiving a double technical foul, Ron Arrest went on to score 15 for his team. The Celtics did fight back in the closing stages but even an impressive run of 12 points in 27 minutes from Ray Allen came too late to halt their L.A. rivals. Veteran Celtics player Kevin Garret -- a previous winner of the NBA title -- could also not help his team, missing an open lay-up in the last few minutes of play and only scoring seven. "We didn't come out with that fire that we've been showing these playoffs," Celtics forward Tony Allen -- who scored a team-high 24 points for his team in the match -- told the official NBA Web site. "They out hustled us I don't think we took that first punch like we should have." It is the 12th time that the Lakers and the Celtics have come face to the face in the NBA finals - the last meeting in 2008 when the Celtics claimed victory four games to two. However, the Lakers are the defending champions having beat Orlando last year.